The Saudi government is aware of the critical demand for waste management solutions, and is investing heavily in solving this problem. The 2017 national budget allocated SR 54 billion for the municipal services sector, which includes water drainage and waste disposal. The Saudi government is making concerted efforts to improve recycling and waste disposal activities. Recently the Saudi Government approved new regulations to ensure an integrated framework for the management of municipal wastes. The Ministry of Municipal and Rural Affairs will be responsible for overseeing the tasks and responsibilities of the solid waste management system. Tagged Composting, Dammam, garbage, GCC, Jeddah, MSW, MSW in Saudi Arabia, Municipal Waste, Recycling, Riyadh, Saudi Arabia, Solid Waste Management in Saudi Arabia, Solid Wastes, Solid Wastes in Saudi Arabia, Trash, Urban Wastes, Waste Management, Waste-to-energy, Wastes. Bookmark the permalink. Thanks for the information I will be in touch with you for my studies in connection with waste management system in saudi Arabia. With a minimum of 22,000 M Ton /day of waste per day in Riyadh, using waste to energy technologies it could be generating 500 MW of electricity or electricity for 350,000 homes, the waste now is dumped in the desert holes which becomes a hazard in many ways. This is such a great article ; as I am in the waste to energy sector, it is especially meaningful and I will continue for more of your.excellent perspectives and possible opportunity. Best Regards, Maxine Pierson Executive Vice President GDT Tek, Inc. I being an Environmentalist had to feel sorry for the Environmental destruction happening in Saudi Arabia the pious land of Almighty. I wish I could contribute what ever best I could for this noble cause & share my more than 35 years of experience for safeguarding Environmental hazards. Wish the entire Kingdom of Saudi Arabia be pollution free in coming future. Really it needs immediate positive action………….. Almighty Allah’s Assets must be preserved / conserved & protected under all circumstances & all anti-pollution measures are needed immediately for the cause otherwise we all are responsible & can never be Forgiven by Almighty Allah……….. Abdul Rasheed Shah………. Hi there, I am fascinated with the idea of recycling. I think this is the future…I live in Saudi and desperately want to get involved in this sector, but in all honesty, I am not sure how to get started. Maybe you could share some idea with me. Very useful article James. Infact I was also in Abu Dhabi last week to attend a conference where ‘future of waste in the Middle East’ was discussed. 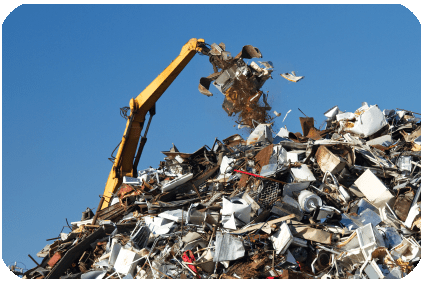 Your article is not only informative but candid in all aspects which is very useful for any company who is involve in a Municipal Solid waste including industrial waste . Great article but I was little disappointed as this situation in KSA we have been hearing about 10-15 years ago. If situation is still some what similar that would be a great pity. I have worked in Turkey, Pakistan, Iraq and South Sudan about SWM as consultant to most of big organizations and I was expecting that KSA should be much ahead.. I would like to draw your attentions that your article can’t be generalized for all Saudi Arabia districts. There is many cities implements the integrated solid waste management systems. Including Sanitary landfills, Methane collection system and leachate treatment. Some Saudi cities like Medina Manwara, Jeddah and Riyadh are established sorting facilities (MRF) and fully running from several years. It will be much appropriate to conduct a comprehensive study to analyze the situation and reach to concrete finding. Dear Nour, I agree as these situations can’t be generalized for countries. I wonder the projects you mentioned were completed by Ceres or some other company? Sorry to say this but what Nour said up there is not applied in reality, it’s only on papers. the very basics of waste management is not applied there. So please stop defending because you just don’t want anyone to criticise. Thats why we will never develop. Not only like Zahir said 10-15 years but 100-150 years as long as we have this mentality. We are Saudis and we know the situation. Specially Jeddah which you mentioned !!! By the way, Any references for the statistics ? – What is the legislation and the financial support of the government in this way. Thank you by advance for your reply and if you could suggest me some links to have answers to my questions. Haha I would appreciate if you can forward me any of the information you requested please. My email is alothaimk@hotmail.com. Mr. Zafar, i thank you for a very informative article, and would appreciate if you can forward me more information regarding the projection of waste management in Saudi Arabia. Its very informative and helpful to me. Could you please send me the addtional information about the waste management practices in Saudi Arabia. Great article..i am working domestic solid waste management center in qatar and thanks for sharing such valuable info..
Can I have the references for statistics? Very nice article. Any information about tipping fees in Saudi or another GCC country like western countries? To cover the operational costs of MRF , MSW or Composting facilities? they are not doing enough. People just throw misc stuff on the road and don’t care. The government should impose strict rules on the civilians and the local shops to stop them from littering their areas and polluting the environment. All the harmful, intoxicants should be heavily taxed, even more than they are now! After the completion of the Riyadh metro service, they should increase the prices of both petrol and diesel and promote the local transportation service. This is how I fell like KSA could have proper control over their pollution and their massive carbon footprint and that is how it should be done. Thank you for the informative artices regards solid waste management in the middle east. The situation in KSA is very real, having travelled to most major population areas i see very little evidence of recycling of waste or 21st century waste management. The PIF was going to establish the Saudi Recycling Company as a managment company for the government but to date nothing has been forth coming. I really would like to get contact with the correct officials regards a national establishment of recycling facilities not just ad-hoc. Again with KSA a lot of talking and wasting of finances on research projects (which take years), its time to get your hands dirty. The establishment of true waste managment policies within the middle east is at least a generation or two behind europe and the rest of the developed world.